A four-person team sponsored by John Navarrette took first place in the 10th annual Lyndon Baines Johnson Museum of San Marcos Golf Tournament Saturday, June 2 at Quail Creek Country Club. 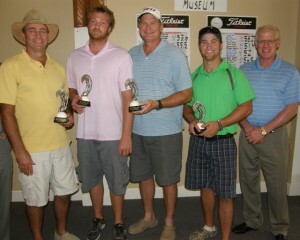 Playing on the winning team were Joey Gold, Byron Marburger, Len Thompson and Todd Gold. The team’s handicap-adjusted net score was 49.9. 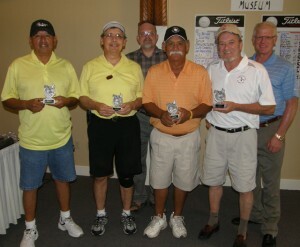 Team Navarrette members Todd Gold and Len Thompson also won individual awards for closet to the pin and longest drive. A group of individuals who called their team “No Apologies” took second place with a score of 50.1. Team members were Joseph Lizote, Josh Wathen, John Recteria and T.J. Vague. Third place went to an American GI Forum team sponsored by Lupe Carbajal and Associates which posted a score of 51. 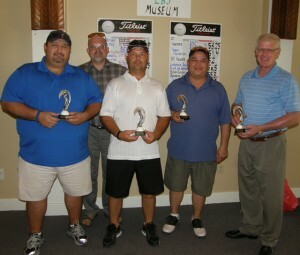 Golfers on the Carbajal team included Steve Bazan, Jessie Sanchez, Ron Currier and Armando Contreras. In the women’s division of the individual awards, Dr. B.E. 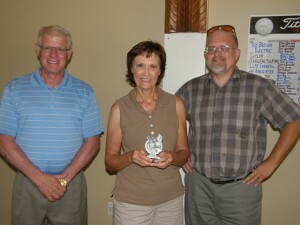 Hughes’ team member Ginger Hughes won both the closest to the pin and longest drive awards. Fifteen teams participated in the annual museum fundraiser which was initiated ten years ago by long-time museum board member Ed Cable who passed away in November of 2009. Silver sponsors received special recognition at the luncheon from museum board president Ed Mihalkanin. Silver sponsors included Ted Breihan Electric, Carbajal and Associates, Dr. B.E. Hughes of Lockhart and Christ the Redeemer Church of San Marcos, as well as the late Ed Cable’s daughter Pamela Cable Frasier, who did not field a team. Rounding out the list of golf teams competing were those sponsored by Butler Manufacturing Company, the City of San Marcos’ Community Service Division, Embassy Suites, Texas Music Theater, Harper’s, the Hobby Foundation, the Austin law firm of Linebarger Goggan Blair and Sampson, McCoy College of Business Administration from Texas State University and Wells Fargo Bank. For the second year in a row, Texas State University journalism graduate Lawrence Olsen, who serves as executive director of the Texas Good Roads/Transportation Association, sponsored a team but did not play. Scott Gregson, treasurer of the board of directors of the LBJ Museum of San Marcos, served as tournament director. The main luncheon entree – fried fish with all the trimmings – was once again prepared on site by San Marcos’ Precinct 1 Constable David Peterson. Museum board members applauded the support they had received from the staff at Quail Creek Country Club, particularly golf pro Gabe Reynolds. FIRST PLACE GOLF TEAM – John Navarrette’s team, composed by Joey Gold, Byron Marburger, Len Thompson and Todd Gold, took first place with a team score of 49.9 at Saturday’s 10th annual LBJ Museum of San Marcos golf tournament at Quail Creek. 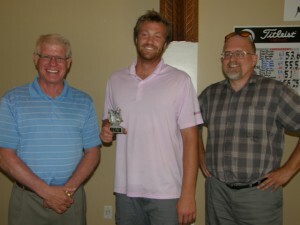 Thompson and Gold took both closest to the pin and longest drive in the men’s division of individual awards. Presenting the trophies to the golfers was Scott Gregson (far right), tournament director and treasurer of the LBJ Museum of San Marcos. SECOND PLACE GOLF TEAM – These guys made “No Apologies” for raking in second place at the 10th annual LBJ Museum Golf Tournament. The team included Joseph Lizote, Josh Wathen, John Recteria and T.J. Vague (not pictured). Presenting the trophies to the golfers is Scott Gregson (far right), tournament director and treasurer of the LBJ Museum of San Marcos. Presiding over the awards ceremony was Ed Mihalkanin, president of the board of the LBJ Museum (back row). THIRD PLACE GOLF TEAM – Lupe Carbajal and Associates’ American GI Forum team which posted a score of 51 included Jessie Sanchez, Steve Bazan, Armando Contreras and Ron Currier. IT’S A SWEEP – The B.E. Hughes team from Lockhart’s Ginger Hughes swept the women’s division to take both longest drive and closest to the pin awards at the 10th annual LBJ Museum of San Marcos’ golf tournament fundraiser. 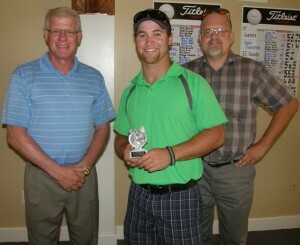 Pictured with Ginger are tournament director Scott Gregson, left, and LBJ Museum board president Ed Mihalkanin, right. LONGEST DRIVE – John Navarrette’s team member Len Thompson made the longest drive in the highly competitive men’s division. Pictured with Thompson are tournament director Scott Gregson, left, and LBJ Museum board president Ed Mihalkanin, right. CLOSEST TO THE PIN – John Navarrette’s team member Todd Gold took the closest to the pin award in the highly competitive men’s division. Pictured with Gold are tournament director Scott Gregson, left, and LBJ Museum board president Ed Mihalkanin, right.